Please don't ask me to do that achievement ever again. Please don’t ask me to do that achievement ever again. By request, my guild and I went into Firelands to work on Only the Penitent. For over half of the raid personnel, it was the only achievement they needed for Glory of the Firelands Raider, which rewards the Corrupted Egg of Millagazor. It probably won’t be much of a surprise to some of you that these guild members have had this particular achievement unfinished for years. It’s particularly dicey. Back when I did it, we took a small group — eight of us — and the six who approached the flame orbs walked. We decided it was too scary to run forward and kneel at the right time. At that time, you got one shot at doing this per week. So if someone flubbed, you had to wait until the next week to try again. Now, you have 10 tries per hour to work on this — but there are still quirks that make it difficult. Druids can’t be in cat or bear form. No one can wear any of the Stylin’ Jungle Hats — for some reason, they trigger the orb. Don’t have any pets along with you, including battle pets. You need to know your latency because you have to kneel at just the right time. Failing due to any reason requires you to zone out completely, reset the raid, and try again. When we did it recently, we were down to our last reset. No one said anything while the group was working on this. When they got it, there was this collective exhale and many in the group vowed they would never do that again. We were talking about this idea in chat after clearing Firelands. You don’t see these kinds of achievements any more — achievements where latency plays almost a bigger deal than the skill of the player. I don’t mind an achievement being difficult — that’s what makes an achievement an achievement. But putting this kind of an achievement into a meta means some people will never get the meta or — in our case — it will be years because they can’t find a group to do it. We’ve asked which older achievements you’re still working on. We’ve asked what makes an achievement worth it. I’m going to turn the question around a bit and ask, what achievement did you do that you just hated? Why do you dislike it so much? What achievement should be removed from a meta because getting it is a pain in the- well, you know where. 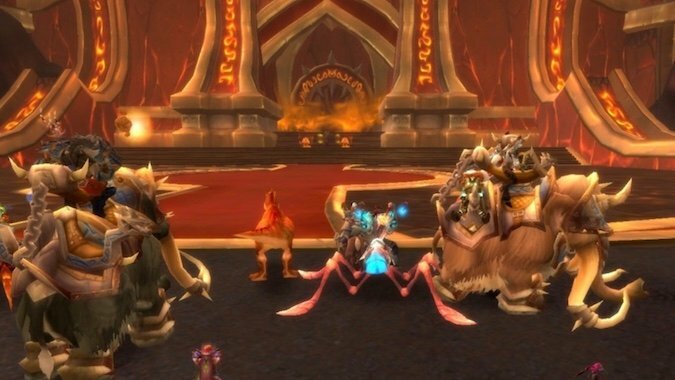 I’m looking for that one achievement you got on one character and, praise the WoW gods — because achievements are shared — you may never have to endure it again for any other toon. I adore my guild mates but I’m going on record right now as saying it’s going to be a very long time before I do this one again.